Lawler says falling to the seventh round of the NFL draft means, “I have a chip on my shoulder.” But he said he couldn’t be happier about landing with the Seahawks. “Just give me the opportunity,” he said. Making the hard look easy has never been a problem for Kenny Lawler. California coach Sonny Dykes, asked to pick the most memorable catch of Lawler’s three years in Berkeley, said there were too many to count for him to pick just one leaping, one-handed catch. Did you know? Lawler took an official recruiting visit to Washington in 2011 on the weekend that UW played its final game before renovating Husky Stadium. He was leaning toward Oregon State before committing to Cal. 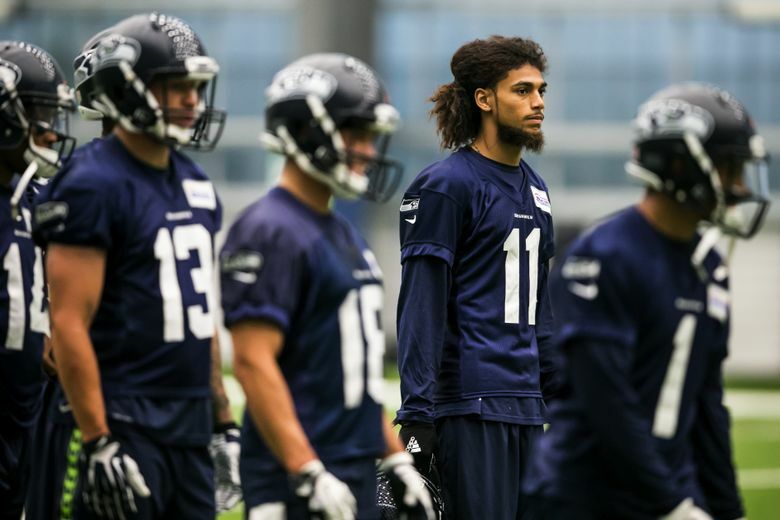 Yet the easy can sometimes be just as hard for Lawler, and that could be the key to whether he can stick with the Seahawks, who selected him in the seventh round of the NFL draft in April. Lawler choked up several times during a conference call with reporters after being drafted. Lawler’s reaction makes Dykes more confident than ever that he’ll make it in the NFL. “In some ways, that was part of him growing up and maturing and him not taking it for granted and knowing how hard it is and how fortunate he is to get an opportunity to play,” Dykes said. Not that Lawler ever forgot. But like many young players for whom the road to the top can seem paved with gold, there were times he simply needed some gentle reminding. Football has been a constant presence in Lawler’s life. His father, Kenneth Lawler Sr., was a cornerback at Oregon until a knee injury in the first game of the 1980 season against Stanford ended his career. After college, Kenneth Lawler Sr. embarked on a lengthy coaching career that included three years coaching defensive backs at Boise State from 2000 to 2002. He is the defensive coordinator at San Bernardino Valley College. Kenny Lawler, the oldest of Kenneth Lawler’s six children, began playing tackle football at age 5 (a younger brother, Kenzel Lawler, is a quarterback gaining some recruiting notice for the class of 2020). Kenneth Lawler says that at age “7 or 8” Kenny Lawler was moved to center because he was the most aggressive player on the team. He eventually settled in as a receiver, due in part to being the latest to possess a family trait of having exceptionally large hands (his hands were measured at 10½ inches at the NFL combine, third out of the 43 receivers who attended). Early success, though, can make it only more difficult than it often is for teenagers to take the long view. Lawler admittedly was frustrated that year, forced to sit out as the NCAA looked into some independent-study classes he had taken (he was cleared after six weeks at which point the team decided to redshirt him). And when coach Jeff Tedford was fired after a dismal 2012 season, Lawler wondered about his place in Berkeley and considered transferring. Lawler decided to stay after a meeting with Dykes — it didn’t hurt that he knew Dykes was bringing in a pass-happy offense that would be operated by quarterback Jared Goff, who was the top overall pick in this year’s draft. “From then on Kenny just kept maturing every year, just grew up a little bit more every single year,” Dykes said. Dykes said one example came last fall, when Lawler dropped a couple of routine catches early. “It was good for him,’’ Dykes said. “He had to show up and go back to work and learn how to practice hard every day, and he certainly made great progress in that way. Lawler hardly could have sounded more appreciative after being drafted, even if the call didn’t come until the seventh round at No. 243 overall. Lawler left Cal with a year of eligibility remaining, in part due to knowing that the team would be starting over offensively with Goff leaving. Lawler was generally considered likely to go in the middle rounds. But a 4.62-second time in the 40-yard dash at the combine hurt him. But he said he couldn’t be happier about landing with the Seahawks. “Just give me the opportunity,” he said. 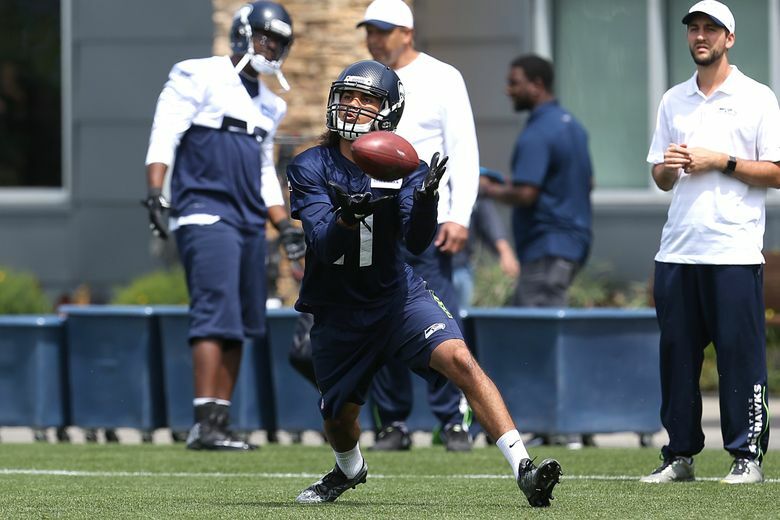 Early returns have been encouraging, even if the Seahawks are also preaching a bit of patience, noting that Lawler lost some weight following the combine and might need some time to develop physically.